Sundar Pichai, vice president of product management at Google, announced on November 19th the immediate availability of the source code for their upcoming Chrome Operating System, under the name of Chromium OS. The actual Chrome OS, as Google said, will be released sometime at the end of 2010, one year from now, and it will be available at first for netbooks and, later on, high-end machines. With this source code freely available for download, various developers can get involved in the project, by creating applications, patches, etc. In other words, from now on, the development of the upcoming Chrome OS will be done transparently. “There is still a lot of work to do, and we’re excited to work with the open source community. We have benefited hugely from projects like GNU, the Linux Kernel, Moblin, Ubuntu, WebKit and many more. We will be contributing our code upstream and engaging closely with these and other open source efforts.” – was stated in the official release annoucement. OK, so please enjoy the official, 1 hour and 20 minutes long “Google Chrome OS Open Source Project Announcement” video, in high-definition! So, here’s what we’ve learned about the Google Chrome OS until now. Under the hood, it will be powered by the Linux kernel (version 2.6.30 in the current source code archive) and a customized firmware, it will have an Ubuntu base (yes, Karmic Koala actually), EXT4 file system and the revolutionary Google Chrome web browser. But the best part is that Google’s Chrome operating system will be so optimized, that it will start in no more than 3 or 4 seconds (depending on the hardware specs of the machine). 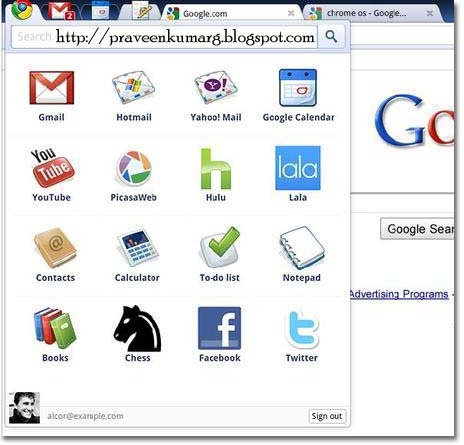 What one needs to know is that Chrome OS will be designed especially for netbook users, people who spend most of their time on the Internet, writing e-mails, chatting, listening to music, playing videos, creating office documents or playing games. Users don’t have to install or update any application at all. All the “action” will take place in the browser, on the Internet. And, above all that, nothing will be stored on the hard drive! Did we forget to mention that it will be the most secure operating system ever? Read below what the the developers behind the Google Chrome OS have to say about this. Below are two more videos to better understand how Google Chrome OS will work and how fast it will be.